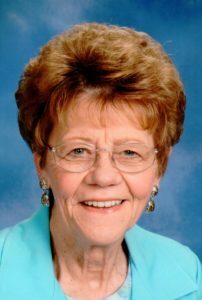 Patricia “Patsy” Eileen Bendele Speer, of Dunlay, passed away on January 31, 2019 at the age of 82 years. She was born March 28, 1936 in San Antonio. On September 1, 1951 she married Robert “Bob” LeRoy Speer in San Antonio. They were married for 61 years at the time of his death in 2013. Survivors include her children and their spouses, Robert and Myra Speer of Aledo, Joan and Tom LeHew of San Antonio, Jeff and Vicki Speer of San Antonio, Sharon and Bruce Philpy of McKinney; 16 grandchildren, one step-grandchild, 24 great-grandchildren; brothers, Franklin (Margie) Bendele of Welfare, Texas, David (Gloria) Bendele of Dunlay as well as numerous nieces, nephews and other relatives. Patsy was preceded in death by her parents, Charles and Frances Bendele; husband, Bob Speer; brothers, Sonny (Julia) Bendele and Bobby (Dottie) Bendele. Visitation will be Wednesday, February 6, 2019 starting at 5:00 pm at Tondre-Guinn Funeral Home, with the Holy Rosary recited at 7:00 pm. Mass of the Resurrection will be Thursday, February 7, 2019 at 10:30 am at St. Louis Catholic Church. Interment will follow at St. Louis Catholic Cemetery. Memorials may be made in Patsy’s memory to the St. Louis Catholic Cemetery or St. Louis Catholic School.